In a world where the Roman Empire never fell it has grown over the millennia to dominate most of the world but there is a dark shadow at the heart of the Empire in the form of its continued reliance on the use of slaves to build the Empire. Two escaped slaves and an idealistic grandson of the Emperor with some controversial opinions about slaves are all forced together as they are hunted across Europe. 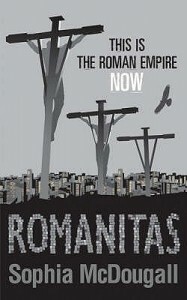 The “This is the Roman Empire, Now” tagline was what initially grabbed my attention about the book; it’s an intriguing premise even if this isn’t the first book to feature an alternate history in which the Roman Empire never fell. I think it failed to entirely live up to its full potential, but it is still an entertaining read. Given that the book’s unique selling point was meant to be that it was sent in a 21st Century Roman Empire the world-building feels slightly lacking at times. Although there is a fair amount of detail and the alternative history seems fairly plausible the Roman elements aren’t particularly distinctive and a lot of the world-building does seem to mostly consist of renaming things. If the book had instead been a secondary world fantasy it wouldn’t necessarily have been much different. While the world-building is slightly lacklustre I think it is the characterisation that is perhaps the most appealing part of the book. The main characters are likeable and the interactions between them generally ring true. The book does a good job of exploring their emotions and why they act the way they do – particularly Una and Dama who are the strongest characters. Occasionally they can make some frustratingly stupid decisions, but that it is believable given how far away they are from the world they are used to. One of the strong points of the world-building is that the plot of the novel focuses heavily on one of the biggest differences between the Roman Empire and the modern day. The institution of slavery is central to the plot and with many of the characters being escaped slaves it does a good job of examining how even those who escape slavery are still haunted by their former status. The plot itself is entertaining and fast-paced, it starts off with some intriguing mysteries and there is a fair amount of action throughout the book as the characters embark on journeys taking them halfway across Europe and their fugitive status does allow for a few tense scenes as they come close to being captured. There could perhaps have been a bit more time spent on the political machinations in Rome which initially seem like a significant part of the book but get largely sidelined by the lengthy descriptions of Marcus, Una and Sulien’s attempt to get to safety. Sometimes the book does seem to rest fairly heavily on coincidence, and the inclusion of some fantasy elements in the form of Una’s powers does maybe feel a bit out of place in what is otherwise a ‘realistic’ alternate history novel. Overall, this is a good debut novel although one that doesn’t entirely fulfil its full potential and it does leave me wanting to read the sequels.